Has your summer flown by as fast as ours has? I feel like the kids just got out of school yesterday and now they start up again a week from today! and not enough laid back, go with the flow kind of days. There are so many things I didn’t get accomplished. didn’t have as many “fun days” with the kids as I wanted to have. But, I can’t change it now. What I can do is try to slow down our last week of summer. and have fun before life speeds up again. I can’t believe I’m the mom of a high schooler, an 8th grader and a fourth grader. I know these four years of Patrick’s high school life are going to fly. 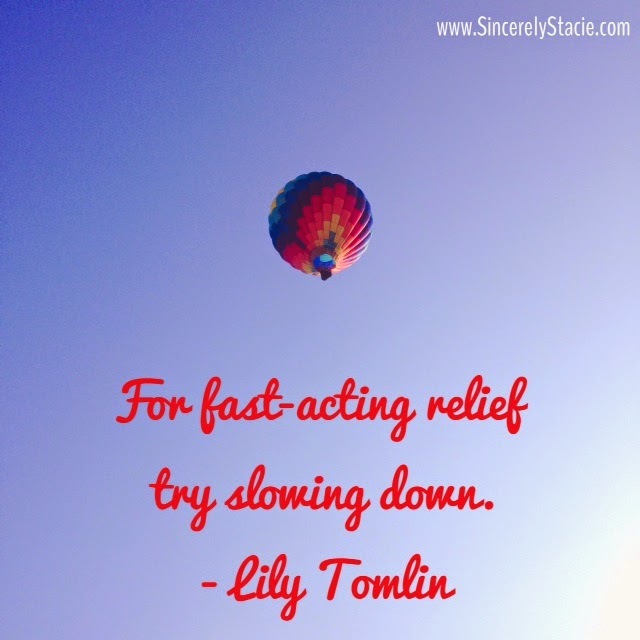 So, I’m taking Lily Tomlin’s advice and going to do my darndest to slow life down.